The Hawaiian go-to. It's what we grew up on and it is ONO! Natural flavors and the colors of the 'bows resting on a scoop of decadent premium ice cream. A traditional Japanese favorite, taste the rich and real matcha balanced with soft and chewy mochi, sweet azuki, and creamy ice cream. Our homemade strawberry syrup is made from fresh strawberries (see the seeds?!). Pretend like you're strolling through an aromatic strawberry field & take a big juicy bite! Drift away and take a vacation to a chocolate-y and coconut-y paradise. Rich, decadent, and so good. The quintessential Hawaiian experience, shave ice style! Dive in to the tastes of the island, a mix of sweet and tart welcome you to the islands and remind you why you never want to leave. SYRUPS: YOUR CHOICE / TOPPINGS: EVERY TOPPING! Can't decide? The Ultimate is your answer. It is also the best way to make friends as there is enough to share! We use only the finest and most pure Hawaiian water that is exactingly chilled and frozen, then meticulously thawed to the perfect state to be shaved in to flakes of love and joy! We go all-natural with real fruits and the highest-quality ingredients we can find. With great care, we blend up our syrups in-house and use them almost as fast as we can make them. Our syrups are sweetened from natural fruit and natural cane sugar. Our mochi is homemade every day, every single piece by hand! 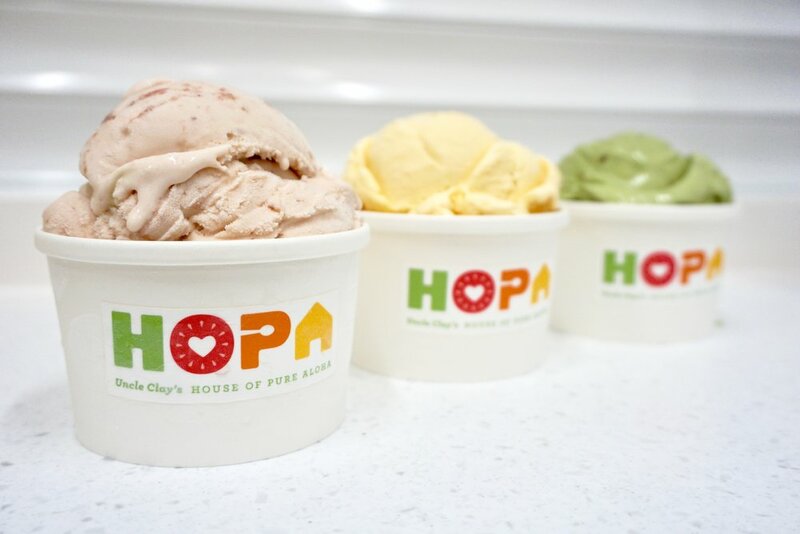 HOPA Ice Cream and Sorbets are freshly made on island in small batches with the highest quality ingredients and local ingredients whenever possible. You can’t go wrong with the always popular HOPA Tahitian Vanilla Bean or Chocolate served at both Houses. Or if you want other flavors, at HOPA Ala Moana you can savor specialities like Strawberry Cream, POG (Passion Orange Guava) Cream, Green Tea, and rotating specials. We also serve delightful dairy-free fruit sorbets. Finally, enjoy Uncle Pono’s ‘Ulu Ice Cream, a very special and delicious ice cream made from ‘ulu, or breadfruit, and produced by Touch a Heart, a Hawaii-based non-profit that provides commercial kitchen skills training and job placement for homeless and disadvantaged individuals. Now you can enjoy shave ice in a cup & on-the-go! Or just relax and sit down to savor every sip. We brew our 100% Kona cold brew coffee and plantation tea in-house and in small batches to deliver the most bold and refreshing flavors. Elevate your Shave Ice Drink to the next level by adding a scoop of ice cream (recommended for cold brew coffee) or sorbet (recommended for plantation tea), fresh strawberries or pineapples, and homemade mochi. Alohasada™ is a special twist on another beloved Hawaii treat—the malasada. A unique process of toasting each malasada creates a warm and crispy texture to the pastry, while adding ice cream and other toppings combines it with cold sweetness. Alohasada™ is available in five special combinations ice cream, toppings, and either a natural or natural poi malasada. HOPA proudly partners with another local company—Watanabe Bakery—to produce fresh, specially-made natural malasadas daily.